Computers are getting ever better at recognising different faces - but on this week's Tech Tent we ask whether facial recognition technology is just too big a threat to privacy. That is certainly the view of the American Civil Liberties Union, the ACLU. This week the rights group urged Amazon to stop providing its Rekognition facial recognition technology to American police forces, saying a guide for the software "reads like a user manual for authoritarian surveillance". Amazon responded robustly, saying the quality of life would be much worse if new technologies were blocked because of how they might be used. But Matt Cagle, technology and civil liberties lawyer for the ACLU in California, says the tech firm has unlocked something really dangerous: "This technology can be turned against protesters - it can be targeted at immigrants, and it can be used to spy on entire neighbourhoods." He says Amazon needs to be far more transparent about its work in this area and there needs to be a public debate before the technology is deployed. Another civil liberties group, Privacy International, claimed recently that the technology was unreliable. Its report found that two British police forces had seen a rate of false positives - people wrongly identified by the system as being on police files - of more than 90%. 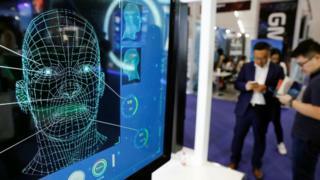 But police forces on both sides of the Atlantic believe facial recognition is improving rapidly and can be a useful tool in areas such as safeguarding major events or spotting terror suspects on the move. Of course, there are places where this debate is just not happening. China is investing big sums in facial recognition technology and deploying it with enthusiasm. Police there have used the technology to arrest a number of suspects at pop concerts. The argument from the technology companies and law enforcement agencies in the US and Europe is that they must at least experiment in this area or risk ceding the ground to Chinese firms, which will not face the same pressure from civil liberties groups. Mind you, Amazon may not be the best-placed business to win trust for this technology. The news that one of its Echo devices somehow managed to record a conversation in a family home and send it to someone else will reinforce the idea that it is a little too interested in watching our every move. We have two more items in this week's programme. On what our excited guest Kate Bevan describes as GDPR day, she tells me she has been waiting for this moment for six years - we try to puncture some of the myths about Europe's new data protection regulation, which has been greeted with something akin to panic by some American firms. And if Europe is leading the world in regulation, can it also produce a few leading technology companies? France's President Macron has been making big claims about his ambitions for his nation to be a leading player in artificial intelligence. We get an assessment from a Paris-based venture capitalist of whether France, and Europe as a whole, can compete with the United States and China.